Set of 20 Disposable floor cover bath mats measuring 50 x 80 cm (24 x 32 inches). This new, high quality disposable bath mat comes in packs of 20. The incredible price makes it cheaper to buy a new disposable mat for each guest than washing and drying your old ones, when you include the costs of time, labour, cleaning products and electricity. The underside is anti-slip to prevent falls, while the upper side is made of a soft, absorbent material that quickly dries the feet. The non-woven underside also prevents water from reaching the surface of the floor, protecting your valuable tile or wood investment from the threats of mould and water damage. The seam around the edges gives this product a fine, classy, finished look. 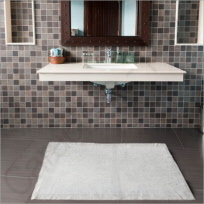 Each bath mat may be used once or several times depending on the preferences of the client, and then can be thrown away. Imagine an end to problems with stains or shoe polish that requires smelly and hazardous bleach, the need to replace stolen bath mats, or expensive laundry bills: we offer the perfect, all-in-one, low-cost solution.